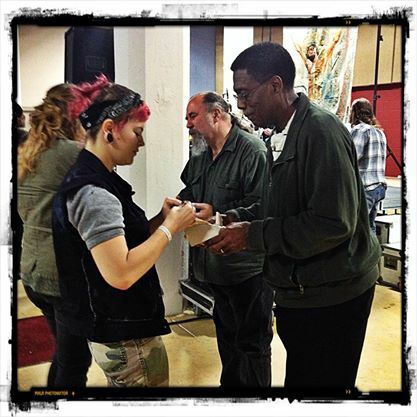 Pastor Ron Brown serving communion to Meghan Grover. We find ourselves, and each other, in stories. As embodied souls, we never stop seeking and finding, revealing and discovering, unraveling and reconnecting. It is hardwired deep in each of us. The spiritual life is founded on story, the Gospel Story and the Good News that we are all called to share. That same story draws us into itself and makes a place for us where we become players in the sweeping epic of life. Living in community means that we are intentionally and inextricably part of one another’s stories, whether it’s as listeners, protagonists, or minor characters. We’re sometime heroes and part-time villains, but mostly we’re just brothers and sisters working it out, by redefining what together means. Our lives are the stories we tell each other. Shared lives become shared stories. We have over 40 years’ worth of stories to share about life in the inner-city, our shared experiences of living side-by-side, our daily interaction with the homeless and under-served of our neighborhood, our place in the evangelical landscape and our counter-cultural approach to the definition of church. We offer our stories to allow people to know us more deeply, we read stories to escape reality and find comfort, we watch stories to experience something outside of ourselves, and, however tenuous the thread connecting us, it is enough. There’s thread enough for you too. Somewhere in these reflections, memories, revelations, and epiphanies, we’ve got a story for you. *In Some Measure publishes only solicited posts from former and current members of the Jesus People community, as well as visitors and colleagues. We do not accept submissions. We have turned off comments for our posts. If you would like to connect with an author regarding their post, please email blog (at) jpusa.org and we will forward your message. Thank you for reading and sharing.